Sometimes it takes forever to complete a DIY project but in this case I completed faux finishing my guest bathroom in just two days. That’s the good news. But the even better news is the reason that it has taken me longer than expected to take some photos and share my result with you– I’ve been working with two new corporate clients but more on that later. My very first step was stopping at Lowe’s to buy the paint and sealer. 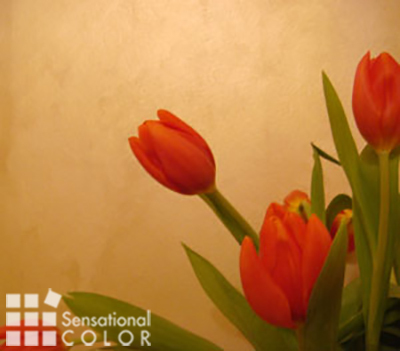 I chose color BP1 ‘Simply Elegant’. While I was there I also picked up the 4″ brush and trowel they sell specifically for this purpose. Next I had my painter put the base coat on the walls and ceiling so all I had to do was to apply the pearl layer. I did this as a time-saver not because it was difficult since the first coat is essentially the same as if you were simply painting any room. After allowing ample time for the first coat to dry I applied painter’s tape around all four edges of two opposite walls. I don’t think that instructions say to do this but I know from experience that this makes all the difference in achieving a flawless finish and is worth the little bit of extra time it takes. Having done faux finishes in the past I have learned that you get the best results if you do opposite walls and let them dry. Then reposition your tape onto the dried walls and paint the remaining two walls. If you don’t do it this way I find it very difficult to get a professional finish where the two walls meet. After the first wall was dry I repositioned the tape and started on the adjacent wall. Using the 4″ brush I began painting at the upper left corner of one wall and worked my across and down. Since I had taped I didn’t bother to cut in the edges ahead but rather did this as I went along. I took extra care to pull the paint out so that it didn’t build up around the edges and I kept an eye on how dry it was getting so that it didn’t get too dry before I could use the trowel. Troweling over the surface is the second step of applying this layer. I went at it at first with a very gentle and deliberate strokes but found that being looser and less measured produced a more pleasing surface appearance. Now that was my first clue that this product was different than most of the prepared faux finishes I have tried in the past. With the first coat I got a feel for the product and how it handled. I found that I could work rather loosely and quickly which was especially good since I jumped right into painting after dinner on Friday night rather than wait until Saturday morning. By the second wall I knew exactly how to get the look I was after and the process went even more quickly and I was cleaning my brush before the late night news was over. Of all the faux finishes I have used I found this one to be the most “forgiving”. As I painted I was able to go back over areas and they blended beautifully. After I used the trowel if there were areas I thought looked a bit too strong I was able to soften the effect by dry brushing very gently over the area using an X motion. I painted not only the wall but also the ceiling because I wanted to make this small guest bathroom seem more spacious. I had originally painted the ceiling with the base coat and I had planned to leave it at that rather than struggle to faux finish it however this technique was so simple that I decided to complete the ceilings with the Brushed Pearl finish to match the walls. After the paint was dry I had my painter put on the protective sealer and put up the fixtures and switchplates. Adding the sealer did not change the look and in fact may have actually added to the luster. Did I mention that I hadn’t even been considering doing a faux finish in this room? I am so over faux finishes at this point having helped just one too many of my friends fix their Ralph Lauren and other faux DIY projects. However, when I saw the Brushed Pearl finish I was so taken with the look that I quickly forgot all that and headed off to Lowe’s to pick up the paint. I’m really glad I chose Valspar Brushed Pearl. The process was simple and the results beautiful. I think that even someone doing faux finish for the first time would have success with this technique. In fact I doubt I’ll receive any S.O.S. calls from my friends if they use this product. This is beautiful….but too much work for me!! Yes, it was more work than simply painting but not nearly as much work as most faux finishes. I have just purchased the Simply Elegant Valspar Base and Brushed Pearl paint. I had assumed the base coat would be the darker color and the Brushed Pearl would be the lighter, and I was surprised to see the opposite when I opened the cans. Your pictures look like the base was darker than the pearl. Were mine tinted opposite what they should have been? Thank you! I couldn’t remember for certain so I went and opened up the paint cans to be sure. The base coat is lighter in the can than the pearl coat so I think what you have is correct. What type of motion should be used with the trowel? Circular? How wide an arch or swoop should I do? I used a semi circular motion of about 12-18 inches. This is what seemed to be a natural and loose movement for me. I think it is more important to have the motion be comfortable and feel natural rather than trying to achieve a stroke that is awkward. Part of the beauty of this process is that I think is is hard to go wrong as long as you just do more or less the same technique on each wall so that you get the same effect. You say that you had your painter do the base coat. In the brochure they are not clear about this step. If I want my final product to look like the sample. What base coat do I use. Is it a satin base of the same number then the top coat is the brushed pearl tinted the same? The base coat is Valspar Interior Satin finish. The label that the clerk put on the top of the can notes Base 1 BP1 Simply Elegant Interior Satin. I believe that this is the same paint as you would purchase if you simply wanted an interior satin. What produces the effect is the top coat but of course having the right color and finish underneath is critical to the end result. The top coat is Valspar Brushed Pearl in the same BP1 Simply Elegant. I hope that gives you the information you are looking for. Is this brushed pearl finish washable? And is this finish easy to paint over in the future? I fell in love with the look! I asked myself these same two questions before making my final decision. I wanted a finish that could be wiped off and wouldn’t show spots if drops of water got on it since I was using it in the bathroom. I did use the protective top coat in order to help insure that the walls could be wiped off without damaging the surface and so far after several weeks of use the finish still looks as good as it did the first day and I am satisfied. Also since I plan to move next year I wanted to make sure that the surface could be painted over easily if for some reason it didn’t hold up or my buyers didn’t care for it. I don’t think I’m going to have to worry about either of those things but since the finished surface is smooth I don’t think it would be a problem to paint over it. did you use a metal trowel or plastic. The instructions say plastic but Lowes only carried the Valspar metal trowel. When I used the metal trowel it left lines from the edge of the trowel.??? Yes, Scott it was a plastic trowel. I don’t recall there being another option but it doesn’t seem to me that a metal trowel would work as well with this process. I’m not familiar with the metal trowel but my gut tells me it would be difficult not to get the lines you are seeing. You may want to contact Valspar directly with your question. Why tape the corners? Why not just faux around the corners? Did you brush the wide x pattern then smooth over with the trowel? Could it be rolled and then troweled and get similar effect? I taped over the corners because it is very difficult not to hit the opposite wall with the brush on the inside corners. When going around an outside corner you don’t have this same problem so I don’t always tape. Without it on the inside corners you waste more time touching up the other wall so I find it much faster and easier to use tape. I don’t think you would get the same nice effect with a roller but you could try it on a test sample board first and see. It might work since you smooth it over with the trowel. Good luck. Hello, I was searching all over for someone that has tried the brushed pearl effect so I’m so glad I found your site Kate. Anyway my question is this. When using the trowel how far apart do you use the 12 to 18″ stroke? right aside of the first trowel made or inches apart? I too am glad you found the site. Welcome! I didn’t use a very exacting pattern put rather let the strokes overlap at random. I even went over areas where I saw brush strokes in the area I had already used the trowel on. I used a slightly lighter touch as it was a bit more dry but in the end it all blended beautifully. Staying loose seems to give this a more natural look I think. Good luck and I’d love to see pics if you decide to use the finish. I think what you purchased is a different product than the one pictured here. I seem to recall that Lowe’s also sold some plastic bottles of a pearl finish but I have not tried that as of yet. The finish pictured comes in two gallon cans that were mixed to match the color I selected on the color card pictured above. This is a bit confusing as I think the products have similar names and when I went to purchase my paint I forgot to bring the color card and I seem to recall the salesman showing me something that was in pre-mixed but then I made a call and got exact name and number. Once I had that he was able to help me get the product you see above. If you haven’t used it yet and it was pre-mixed rather than custom mixed you could probably exchange it for this product if that is what you had intended to buy. thanks so much. I have gotten the right stuff now and I cant wait to put it up. Thank you for responding. I think my wife and I finally came up with the color so this weekend should be a go. I sure hope it comes out as we expect and thank you for your input. You are very welcome, Steve. I hope it looks sensational. Please sent before and after pics if you would. Hi! I can’t wait to try the brushed pearl, but have encountered a small problem…every Lowes that I’ve gone to in my area does not have someone working in the paint department who has used the product. I am looking to do a subtle cream color on my ceiling but the sales reps don’t know how to assistant me in buying the paint – I know I have to put the base color on first, but does the brushed pearl also get tinted and is it the same color? I’ve been told many thing from tinitng both the same color, to using a darker color for the top coat. And can I use any color from valspar collection or does it have to be from their brushed pearl color selection on the palet. The simply elegant on the palet looks like what I want – maybe a little lighter…any suggestions?? I thought that ‘Simply Elegant’ was the best light neutral for my project because the ‘Very Thoughtful’ was a bit too green and ‘Natural Flavor’ a bit too yellow. I painted my guest bathroom and wanted to make sure the color was flattering to my guest when they looked in the mirror plus with it being a small space with no window I wanted a lighter value. The base coat for ‘Simply Elegant’ is lighter than the top coat which is exactly the opposite of what most people tell me they had expected. I originally painted both my walls and ceiling in this color with the intention of leaving the ceiling with just the base color and not putting on the top coat. 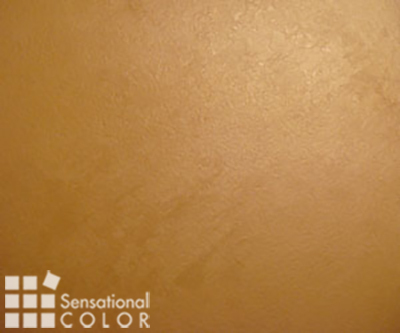 I would suggest this for your ceiling too if you go with ‘Simply Elegant’ because it is a very lovely cream. As for lightening the top coat. You could do it but you might lose some of the effect. Plus when you get into changing formulas you won’t really have a good idea as to whether or not it is right until you try it. You might ask the guys at Lowes to lighten it a bit and then do a sample board to see what you think. You might also check the Valspar website to see if there is an independent dealer in your area where you could purchase the paint. I’m a regular Lowes gal but in this case having a salesperson to work with you that really knows the product and how to custom mix paint could be helpful. 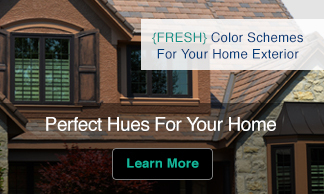 You can find a zip code locator on Valspar.com. I hope that helps. Let me know how it turns out. I’d love to have you post your pictures on RoomVues.com for all to see. I just found your site and the comments of a lot of frustrated users after working with this paint for a week. I am trying to use it on a wooden cabinet, and it looks terrible, as though someone stuck their hands in the wet pearl. I’m not certain whether to keep trying or start over with something different. I had the impression the trowel was to be held flat. Are you just using the edge for the strokes? Do you think my problem is using it on a wooden surface? The paint can says it is for wood. I’m sorry to hear that the finish is not working well on your cabinet. I’ve only used the Brushed Pearl this one time on a flat wall surface so I haven’t tried in a surface like the one you mention. I do think however that it might be difficult to produce the same results as on the wall. You are correct that the trowel is to be used flat. I used the plastic trowel flat against the surface of the wall after the pearl coat had dried slightly. If your cabinet has any trim or areas that are difficult to paint around it would take great patience to paint areas, let them dry and cover so that you could paint the adjoining areas without messing up those areas that you were satisfied with. While I think this is a wonderful faux finish for walls I don’t think I would use it on any surface that wasn’t fairly large and flat. when you go to lowes you can ask for the brushed pearl in the color of your choice and then the base coat will be a satin(my choice of gloss) interior paint tinted in the same color. I was very frustrated with the lowes people till I finallly found someone who knew what he was talking about. Thanks for all your help. Thanks for adding the helpful comment Tammy. II have been thinking of applying this Valspar Brushed Pearl(Wood Grain) in my kitchen. I have never painted a faux finish before, so I am a little nervous about trying. Also, I have a number of small areas that I will need to paint that I will not be able to use a trowel. Should I not even attempt it, for this reason? Could I use a brush or something to create some sort of texture in these hard to reach spots? Please advise. Thanks! It does sound like your project may be a bit more challenging than mine was but that doesn’t mean you shouldn’t give it a try. If I was going to do tight area with this finish I might try to find something that would act in the same way as the trowel but would be much smaller. I’m thinking that you might explore the art supply store and look at the plastic palette knives that are made of a similar plastic would allow you to position the flat surface against the finish. You may also find something else that would work at a kitchen or hardware store. You don’t want it to be too small because then the look in the small sections would be different than the rest of the room. Before you begin on the walls I would try your mini trowel and regular trowel on test boards so that you can figure out how to use the small one to get an effect similar to the look that will be on the larger wall areas. I think this would work better than the brush but you could try that also. Maybe using a foam brush rather than a regular brush might work. I think it you experiment you’ll find a way to achieve the look in those tight spaces and if you aren’t happy with the results at least it isn’t on the walls. If you do find something that works well (or not so well) I’d appreciate it if you’d come back and share with us what you used so if other readers will know what you tried to solved the problem. Of course if any readers have other ideas for Erinn please feel free to add a comment or idea to the post. Has anyone ever tried the Brushed Pearl paint / techniques on a floor? I’m interested in doing an area that has both concrete and plywood subflooring, so concrete stain – my first choice – won’t work. In order to get some depth & texture, I’d like to try brushed pearl (covered, of course, with a topcoat to protect, even though it will be light traffic). Any comments / suggestions / advice? The effect could be interesting on a floor but I believe this paint would have the same durability as standard wall paint so it may not hold up even with a topcoat. I think your best bet would be to go the Valspar website and find a dealer close to you and ask them for a recommendation on how to best use and protect this finish for a floor. There are also many interesting paint finishes now for concrete that may also work on the plywood and a good dealer should be able to help you there too. I haven’t tried them yet but with the nice weather coming you may see me emptying my garage and doing a little DIY experiment of my own. I’m so glad that the Valspar Brushed Pearl paint worked out so well for you. Your room sounds just gorgeous. Good for you in having the patience to do your ceiling. It is also very encouraging to know that you also found this finish to be easy to work with. I’m sure you will enjoy many mornings waking up to enjoy having such an elegant look in your bedroom. I’d love to see pics of your room too and if you’re agreeable I’d like to share them with all of my readers. I just received some pictures from another reader that used this product with great success and will be posting hem this week. Thanks for stopping back by to share your experience. I really appreciate it. Please drop by again soon. I like it when you visit. As a self employer painter who has had a fair amount of experience with faux finishes, I have done sponging, ragging, graining, marble, etc. I was very disappointed with the look of the pearl finish. I followed the procedure and ended up with a look that I didn’t like and the customer having a paint job that she was just satisfied with instead of delighted. I have not been able to see a decent photograph of this finish as most examples have their camera’s flash turned on and it looks too overexposed to get a realistic idea of what it is really supposed to look like. How long do you need to wait before using the trowel? Also, should the X pattern be random? pearl finish. Someone suggested I use a grout trowel or dense sponge to move the glaze around instead of the specified trowel as I don’t think that will pick up the paint in the textured grooves. Am I just setting myself up for a disaster or could this be worth a try??? For the clear coat, did you do Satin or Gloss? I applied the Simply Elegant color this morning, after doing the base coat yesterday, and am EXTREMELY disappointed. 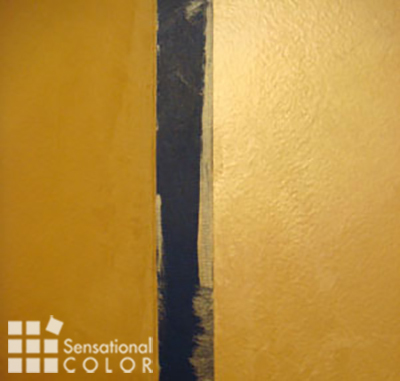 I searched online for other comments about this paint (something I should have done before buying it, and yes, I have done faux finishes before with much better results) and found this site, where you used the exact color I chose. Unfortunately, mine looks nothing like these pictures, and I’m not sure I could have done anything to help it along because the color looks PINK. It’s absolutely awful. What makes it worse is that I plunked down about 100 bucks for all the materials. I feel like a sucker. Oh Amy, I’m so sorry you had trouble with this finish. It sounds like something may have gone wrong at the paint store since if you used the same color I did it shouldn’t look at all pink. It is a very yellow based neutral. 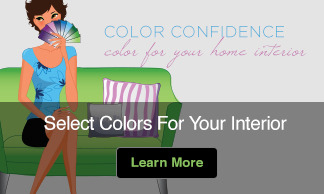 At least on my screen the pictures look pretty true to the color in my guest bath. If the color wasn’t mixed correctly or if it was put into the wrong base the store should refund your money. It won’t cover your wasted time but at least you won’t be out the money you spent on the paint. I just finished my second coat of the BP15 Sea Glass (I did it over Valspar Signature Sea Escape) and it has turned out beautifully!!! I’m so happy with it. It’s the first wall painting I’ve ever done and I agonized over what I wanted to use. I tried many things on the spot where the medicine cabinet would go and this (with two coats)was just what I was looking for. It looks like lightly textured pearly aqua wallpaper, very elegant. Watching the video on this site http://valsparatlowes.com/do-it-yourself/steps/Painting_Decorative_Brushed_Pearl.html definitely helped me know what to do. I also learned you had to have the plastic trowel (the hard way LOL). Amy, I’m sorry your color didn’t turn out, sounds like they did mess it up! I used this brushed pearl technique on two bedrooms. I used Simple Elegant and Too Real. I can’t believe all the horror stories. I absolutely loved this technique. I agree that the set time is the most important aspect of succeeding when using this finish. If you don’t wait long enough, the plastic trowel will not catch the brushed pearl application; if you wait too long the trowel sticks and you would need to rewet the area. Some times 5 minutes to long or to soon can make all the difference. I, too, have applied many different faux finishes. This by far was the easiest (it took me only two hours to put on each pearl application in a big 16×20 room) and it looks like a million bucks. Family and friends continually compliment me on how wonderful and elegant the finish is. I hate to say it, but it sounds like some of the sales people at Lowes may be the real culprits by not giving the right product or color. I would do this finish again, and just may decide to redo the living room with it. I’m so glad that you too had good luck with this finish. Any chance you might share some photos? I’d love to post more a few more. Like you I continue to receive rave reviews of the finish and am glad I took a chance to try it out. I just painted my daughter’s room pink (which she picked out), but apperantly the pink is like the pepto bismol color. 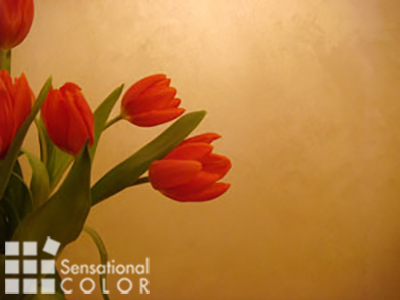 If put a coat of this pearlized paint to the wall, will it tone it down or do you think it will be over done. If so, what are you suggestions…I really don’t want to change the entire room, I just want to tone it down a bit. Hi! your walls look beautiful. Having done this technique, do you think it would work on textured walls? what about to do stripes (pearl and non-pearl in the same color)? I have been experimenting with the brushed pearl finish, using BP1. It is very shiny – and in some lights is so reflective it looks just silver, can’t really see the nice golden/neutral shading that can be seen in other lights. I haven’t used the clear coat finish – will that cut down on how shiny/reflective the pearl finish is? I’d like something with a little more subtle effect. Thanks for all your advice. I just got finished with painting the dining room and it looks terrific. I had a problem at first with the brushed pear. I was unaware that your are supposed to tint the brushed pearl. The people at Lowe’s didn’t really know about brushed pearl so i called valspar twice. One rep said you don’t tint and another said you do. You have to tint the brushed pearl. I used the same color base coat and brushed pearl. The great thing about this technique is that you really can’t mess it up. If the brushed pearl is not dry enough you can keep using the trowel until it starts to dry!. I absolutely love it. I was wondering if anyone has tried a darker color pearl not the same color? I too cannot find anyone at Lowes that knows anything about this product. Do you have to use the colors on the color card or can you pick any Valspar color and tint the pearl accordingly? We have granite countertops in the kitchen and a shade too brown or too green makes all the difference in the look, so I’d like to know if I’m locked into the specific colors Valspar uses on the card? thank you for sharing, I just bought some of this paint from Lowe’s and was searching on how to use the brushing and trowel technique, this helps alot! I tried to do the brushed pearl, and mine came out horrible. I asked the paint guy what I needed and he sold me a can of the pearl stuff but he did not mix any color in it, they were supposed to mix it with the same color as the base, right? Yes… on the back of the color card, you have 2 colors. The first color is what you tint the Signature Colors Interior Satin with, The second color is what you tint the brushed pearl. I had a hell of a time trying to get the plastic trowel to work as I have a texture on my walls, which made the trowel pointless. I managed to do it using a dry fluff nap roller as a trowel. Just loved the look. You definitely need two coats to get the best effect. It is very elegant. What kind, if any, texture do you walls have? I have a medium to heavy knock down on mine. Plus, I live in the desert. Maybe I should do tiny sections at a time? Between the a/c and the dry climate I think my paint is going to dry too fast if I attempt a 4 x 8 section. 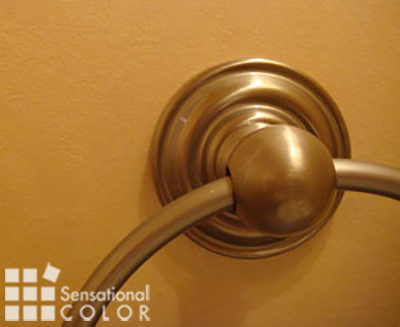 .-= Teri´s last blog ..Master Bathroom Metallic Paint Craze Continues =-. I tried the brushed pearl project and it was awful. The Eclipse color came out orange, it was so ugly. It did not work on textured walls at all. What a waste of a lot of money on base coat, top coat and the trowel and the paint I used to repaint over the horrible result. Tried the pearl, terrible,terrible,terrible. I am now in the process of painting over it. I tried following the steps given by Lowes and I ended up with a big mess. I am sorry that there is a no return policy on paint at Lowes because I would be returning this right now. Just finished my bathroom. Make sure you read all the tips you can before you start! I gave it two coats and the second coat gave me almost the look I want (I probably should have gone a little heavier on the brush strokes) I do recommend doing very small areas. Mine dried very fast. I wound up painting a 2 x 4 section and immediately using the trowel. If you keep at it, eventually the paint starts to dry and thicken. I do not recommend using the brush they tell you to buy. I also had hairs all over my walls. Invest in a good brush. Think I’m going to love it when it’s dry. Then decide about the top coat. I use the brushed pearl with no color added ..over light grey in my bathroom and over black paint on my livingroom ..it looks great! The Lowes in my area no longer has any color cards of the green brushed pearl I wanted, and I lost mine. It looks like it’s the one in the bottom row, left corner. Do you happen to still have the color card and can tell me what the bottom left corner is called? Thanks! April, can you tell me to what degree using the pearl coating without tint altered the color of your base coat? Did it just make it pearly or did it lighten or change the shade at all? I’ve been thinking of doing this myself but if the color changes it will clash with adjacent wall. BTW, I did my bedroom using this technique and I found it easy and three years later I still love it. My walls are imperfect and it helps to camouflage the issues. just read all of the comments and watched the video. don’t know whether to be deterred or excited, the reviews were so mixed! going to paint a purple countertop. have a large piece to practice on. it only has to hold up for a year. will let you know of success or failure! I tried the brushed pearl B16…horrible horrible horrible!!! The problem may be the knockdown drywall. The trowel is USELESS on such a surface. I tried sponging it…still horrible. What a superfluous use of time and money. The base coat is really nice though. Maybe I’ll just keep the base coat and forget about the faux. am really impressed to read everthing at alone place. I tried this on foam board and it turned out great! Unfortunately, it did not work on my walls because they are already texturized, which makes using the trowel impossible. I am so disappointed because I LOVE the look and can actually do the technique. I wish Valspar would make it clear, though, that it simply won’t work on texturized walls. It would have saved me $100+ and a lot of time and effort. I wanted to try this on one accent wall in my tiny WC. Unfortunately,our local Lowes only sells this in gallon size. If I special order a smaller container, I must purchase at least 4 which is still a gallon and more expensive with no return. Is it possible to get a simular effect without this very special product? I love the effect, but I want a different color from the ones offered. Is it possible to use Brushed Pearl on top of any other Valspar colors? Did you ever get an answer? I watched the video which states that there are 32 colors, but there are only 7 “popular colors” listed on Valspar’s site. Your local Lowes better have a great paint associate. Most will not. You can pick any base coat color but realize that the pearl base only has a few specific colors. This means the pearl base may be tinted to a green color for example but if you change to a red base paint your going to have red walls with a green shimmery effect. So I only really suggest it if you are good with colors. I have personally mixed a blue under color and a teal brushed pearl color. It gave it a nice ocean type feel. And it came out nice well as nice as it can look on a stir stick. So hopefully if you choose to try this you can find a Lowes paint associate like myself that can work well with colors. I used the brushed pearl paint combo in my Sandy Damaged den. Came out great. Looking to do it on my other rooms. Susie, I don’t recall because this was several years and many, many projects ago. I recommend following the recommendations given by the manufacturer. The post shows it being used in my guest bathroom and it was just great. In a full bathroom I believe you will be fine with the sealer over it since even without the finish is pretty resilient. Can this be painted on normally without making the “brushed” effect? I would love to paint a pearl accent wall in my daughter’s bedroom, but I don’t want the brushed look. I’m having a hard time finding a metallic pearl paint that I can simply paint on. I was wanting the same thing, Ryleigh. Did you end up painting without the technique? How does it look? I have pearlescent paint on my walls what do I use to paint over it if I want to change it? Depends on the color it is and the color you are going to. Best case scenario is to just paint over it. If it’s a harder to hide color I.e. Red, yellow, blue then prime the wall first to kill off the color. If you are going to a red or blue color then I’d get a light grey primer and then paint over with your blue or red. Let’s say the pearl is a greyish color and your going to a tan or white then you can just get the paint and paint over it.